Milka Rivera. Hunts Point, the Bronx, NYC. August 2012. Trauma due to violence is a very complex issue in our communities. Learning of the life and tragic death of 17-year-old Damian Martinez, aka CHEEZE, aka LOVE, gives this trauma a face, mainly those of his grieving family and friends. 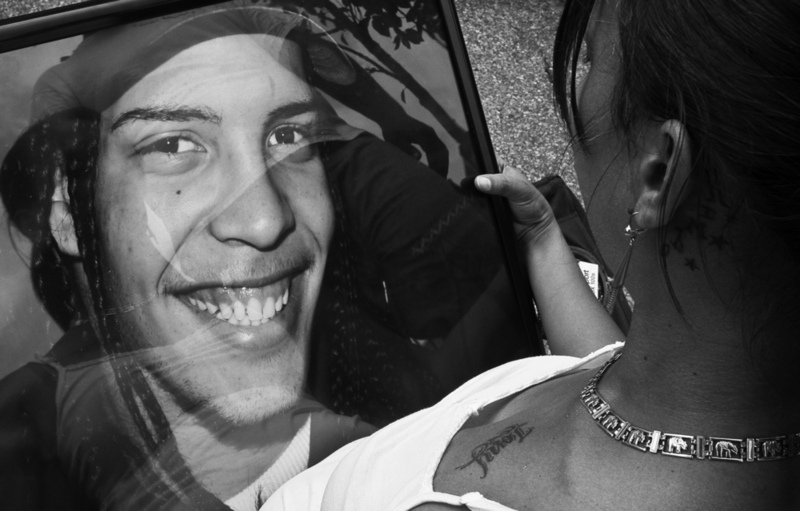 This first series of photos mainly feature Damian’s mother, Milka Rivera on the day of her son’s mural painting in late August 2012. Unfortunately, in Hunts Point she is not the first mother to honor the life of her son by commissioning artists to render their images on the wall for all to see. As a hardworking single mother, she tried to shield her son away from the pitfalls of the streets to no avail. She fondly remembers her son as a very energetic and larger-than-life personality that was very popular in the community. Her kindness in letting me into her home and life is my main motivation for getting this story out to the public. She relies on the company of CHEEZE’s friends and her family to help her keep her focused on living. Portrait of Damien "CHEEZE" Martinez. Hunts Point, the Bronx, NYC. August 2012. Tattoos of LOVE LIVES aka CHEEZE. Hunts Point, the Bronx, NYC. August 2012. Damien "CHEEZE" Martinez Mural. Hunts Point, the Bronx, NYC. August 2012. J and Will. Hunts Point, the Bronx, NYC. September 2012. 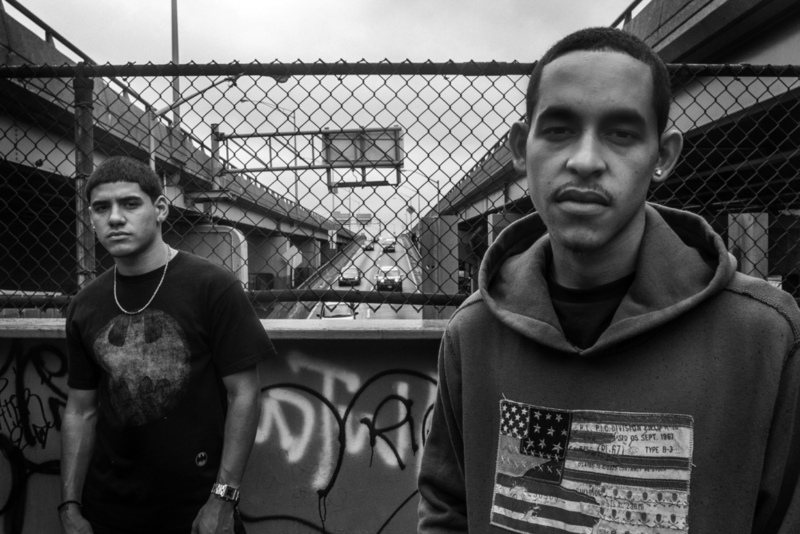 J and Will are both young residents of Hunts Point, and when I sat down with them in 2012 to speak about CHEEZE, I came to learn more about how their lives were changed by his murder. J and Will, both young artists themselves, take pride in introducing graffiti to CHEEZE, and were there to see the infamous LOVE piece come to life. A little older then CHEEZE, they had already been getting up on walls for some time before CHEEZE took to the rush of writing on walls and starting following them on missions. Like everyone else affected by the life and death of CHEEZE, J and Will were forced to reevaluate their lives immediately after his death. Both decided that they had to move on with their lives, and that meant they left behind writing on the walls, and were both in school and working at the time of our meeting. Like most of CHEEZE’s friends and family, they never received real support in processing this murder. Cell phone image RIP CHEEZE mural being painted. Hunts Point, the Bronx, NYC. August 2012. LOVE LIVES. J and Will. Hunts Point, the Bronx, NYC. August 2012. LOVE LIVES: Angel "DAO". Hunts Point, the Bronx, NYC. September 2012. This is Angel, aka “DAO”, a close friend of Damien CHEEZE Martinez. I had the fortune of meeting him and photographing him in early September 2012. He told me the story of how he and CHEEZE met, and about the brief and tumultuous relationship they had. At the time he expressed how affected he was by Damien’s death and how deeply changed his life. He confided in me how depressed he was and how he never felt comfortable speaking to the therapist his school provided for him. He was very honest with me and his trust is something I am very grateful for. Last time we spoke, he was trying to get a new job without much success, and was expecting a child. LOVE LIVES. RIP Medallion on Angel. Hunts Point, the Bronx, NYC. September 2012. LOVE LIVES. Angel on rooftop. Hunts Point, the Bronx, NYC. September 2012. LOVE LIVES. Tim. Hunts Point, the Bronx, NYC. August 2012. Tim and Damian were very close friends for most of their young lives. His name came up several times while I was researching into Damian’s life and it was a true pleasure meeting him this past summer. He was able to give me early insight into CHEEZE as a graffiti writer by sharing with me his LOVE graff black books full of colorful hearts and words. Tim says his life has changed completely since Damian passed away. He has gained some weight, stopped spending time with too many others or going to school, and prefers staying at home alone. 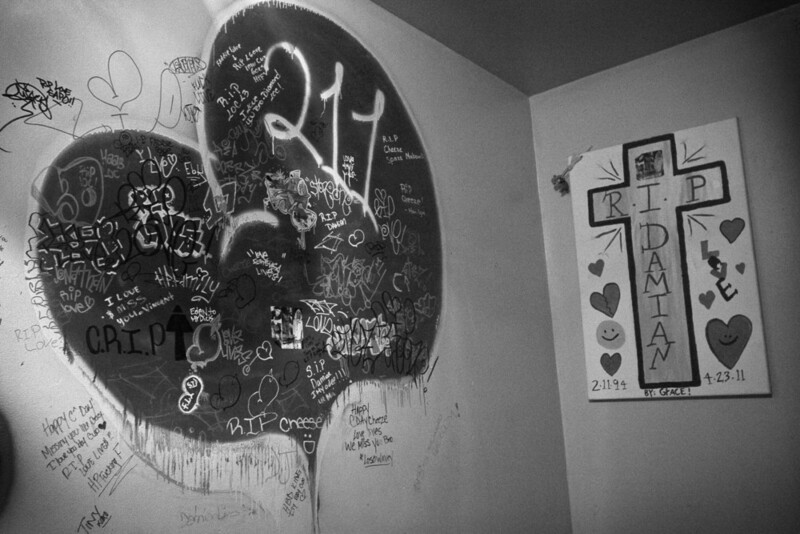 Tim never sought professional mental services after LOVE’s death. LOVE LIVES. Original LOVE Tag in Tim's House. Hunts Point, the Bronx, NYC. August 2012. LOVE LIVES. 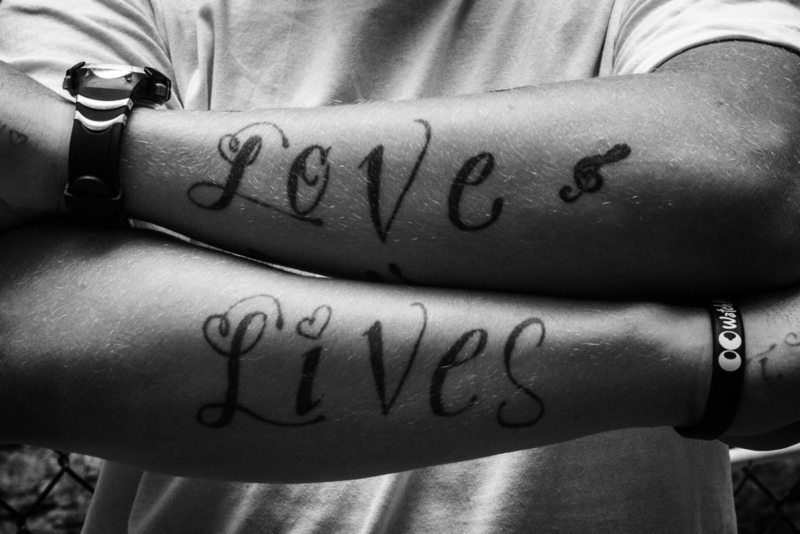 LOVE LIVES Tattoo on Tim. Hunts Point, the Bronx, NYC. August 2012.